Leadership isn't something you only read about in a book. You have to live it. I see newly minted managers focusing on the oddities of great leaders and lose site of the basics such as setting the example, taking care of your people, planning, and managing expectations. Steve Jobs may have berated and told people their ideas sucked, but that's not what he did on a daily basis. These are just the stories that stand out. The basics are more important for your day-to-day business life as a manager. Lead to get people where they need to be – don't try to be someone else. Lead, follow, or get out of the way. San Diego video artist Cy Kuckenbaker. I heard this piece on KPBS while driving a couple days ago. 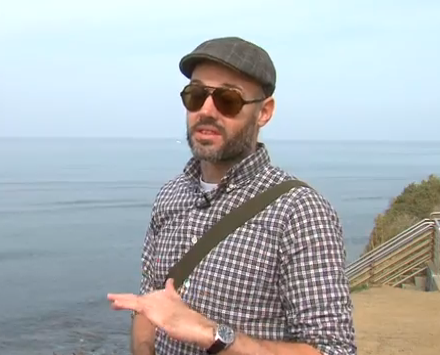 It's about a San Diego video artist who spends up to two hours editing for each second of video he produces. You've probably seen his work. What's interesting is his art is displayed on his website, cysfilm.com, yet the KPBS reporter makes no mention of this fact. Instead, the reporter directs you to kpbs.org. Obviously, the goal of KPBS is to direct listeners from the audio program, since that's their primary medium, to their website to generate revenue via ads. So, I somehow feel that a key portion of the reporting is missing, specifically where Kuckenbaker's art is on display. Imagine an article about the Mono Lisa on exhibit in San Diego without any mention of where it will be displayed other than, "You can see it for yourself at kpbs.org." Flying over the Naval Academy on my way into Lee Airport in Annapolis. Getting saluted is weird, at first. By the time a I was commissioned I had rendered thousands of salutes, but, in the beginning, receiving a salute felt strange. I remember thinking: yesterday I didn't rate this salute, today I do. Then, when I was promoted to captain, it happened again. It felt strange when lieutenants saluted me but I quickly got used to it. I hadn't thought much about getting saluted until ENS @B.E.N_DRT tweeted about it after he graduated from the Naval Academy earlier today. Getting saluted by mids on my way back from the stadium was the weirdest thing. As an enlisted Marine and a Midshipman I was intimidated by officers. Everyone is. In boot camp, my drill instructors were god and even they had to call officers, "Sir." It was best to avoid crossing paths with an officer whenever possible. Then, when I was a newly commissioned second lieutenant, I wasn't sure exactly how to return a salute in certain circumstances. Salutes are suppose to be rendered within 30 paces of a senior officer. The problem is it can, at times, be awkward in crowded places like the PX or sometimes the junior doesn't notice the officer. Occasionally, a junior might intentionally ignore an officer's presence – as respectfully as possible – to avoid the awkward encounter. But, officers pickup on this and it's mildly disrespectful. As an officer, I quickly figured out how to avoid these situations. I would preemptively greet the junior with a "How ya doing?" or "Good afternoon," – even before they saluted me. There's nothing saying that I couldn't greet a junior first. The only requirement is that they show respect by initiating a salute. I would always return their salute with a smile while looking them in the eye. Trust me, a junior greatly appreciates it when you acknowledge, rather than ignore, their presence. Instead of waiting until a salute – or lack there of – escalates to the point of disrespect, just head it off at the pass. You'd be hard pressed to find an American born before 1960 who doesn't know this movie line: "I want to say one word to you. Just one word. Are you listening? Plastics." The problem with plastics, like the internal combustion engine, is they're too good. Plastics are used to the point that they've impacted our planet. Carbon emissions in the air and plastic pollution in the ocean are growing problems. It's become such a factor that local governments have banned plastic bags and beads. We had a running joke in Djibouti. Someone would ask, "What's the official flower of Djibouti?" and another person would respond, "The plastic bag." and a third person would follow up, "Is the plastic bag the official flower or bird of Djibouti?" and finally, someone would say, "Both!" As I pointed out last month, when writing about Blue Dot Refill, the benefit and curse of plastic is it won't go away. It's great that it lasts forever, but, then again, it ends up too many places it shouldn't be. It's better to pass command line args as an array than a string. If you've ever needed to rotate, resize, or convert an image, programmatically, then take a look at the OS X SIPS command. SIPS is a highly optimized part of Core Graphics (Quartz) designed for the Automator app. It's been around for nearly a decade (Tiger 10.4). I first heard about it when chatting with another Apple engineer who was developing it in Cupertino. Since Java's early days I have been manipulating images inside of web apps. In the 1990s, Java image manipulation was very crude and slow. If I recall correctly, it could not be done, easily, on a headless server. I believe it required instantiating a Java applet (canvas) to do the manipulation, hence the need for a windowing system. The downside of SIPS is it hasn't been continuously developed. Some of the things it can't do is overlay text or read GPS EXIF metadata. But, after reading Dave Winer's request for a text image overlaying API, it got me thinking again. Especially when I proposed this idea for Twitter 519 days ago. I'm surprised there isn't already a popular text image overlaying REST API. Perhaps soon, very soon, there will be the API we seek. Last week, I visited the "Ruins of Golden Hill." This week, I saw the ruins of the Poinsettia Wildfire in the making as it burned two dozen homes and apartment units. When I last experienced wildfires, in 2007, I left my wife, safe and sound, in Santa Cruz to return to our home in Carlsbad. About 20 minutes before getting home I saw the power of these infernos when I drove through the Horno Fire as it jumped the 5 Freeway at Camp Pendleton. This week's Poinsettia Fire, along with the other San Diego County wildfires, were tiny compared to 2007. But, size doesn't matter if it's your home that burns. I first heard of the Poinsettia Fire when I was about 20 minutes away in Del Mar at a Tech Coffee meetup. My wife left school to get her mother and evacuate. I went to see how close the #PoinsettiaFire was to our house. 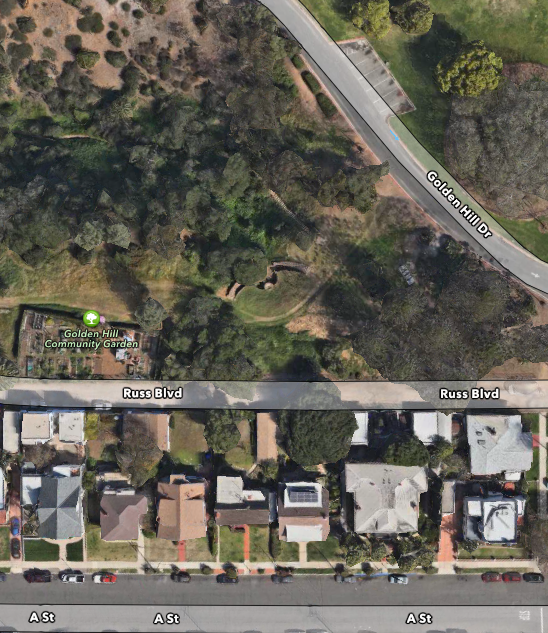 I watched the fire fight for two hours at the intersection of Poinsettia Lane and Alicante Road (yellow X). Several helicopters continuously scooped up water from the La Costa golf course and dropped it on the fire a couple thousand feet away. It didn't take long to halt the fire's easterly advance --- mainly due to the Johnny-on-the-spot skilled airborne fire fighters along with the shifting winds and small fire line threatening to jump Alicante Road. The Poinsettia Fire had one fatality discovered by firefighters while checking for hot spots. What's odd about this fire is where it started. This area of Carlsbad hasn't had a major wildfire in 40 years which begs the question, "How did it start?" The century-old Golden Hill Fountain Grotto ruins. Yesterday was too nice of a day to pass up so I walked to Balboa Park to read some Hemingway. On my way there I did a little exploring and happened upon the ruins of the Golden Hill Fountain Grotto. It's easier to spot this landmark from a satellite photo than on foot since it's below ground level. Surprisingly, I've run within feet of the ruins scores of times I but never knew it existed. Water hasn't flowed from this century old fountain since before World War II. It's highly neglected, but still worthy of spurting water. Its rock and stone construction is the key reason it remains. The accompanying wooden benches, built along with the fountain, have long since crumbled. The oval shaped ruins, dead center. The City of San Diego owns the ruins, but they obviously haven't done much upkeep. Nowadays, it's an ideal teenage hangout with its graffiti and cigarette butts. The City has tentative plans to fix up the fountain, but, as of last fall, they haven't pegged a cost for the restoration. I always find it a bit exciting to discover treasures like this – something that's always been there, but I never knew. History under my nose. Job Interview: What to Wear? Everyone knows you're suppose to wear a business suit to a job interview, right? It's not that you need to wear a suit, but you wear it to show you know what you're suppose to do. However, things are different in high tech, aren't they? Yes and no – it depends on the company's core business. I've worked at places where each VP in IT wore a suit every day and I've also worked at places where we'd never hire someone who came in for a job interview wearing a suit. It's important to understand a company's culture. So, if you don't have an inside connection to the company you're about to interview at then how do you figure it out? 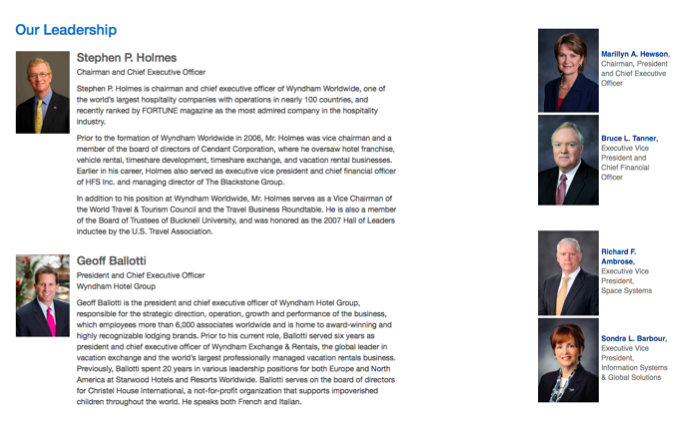 Simple, look at the company's website and see what senior management is wearing. Do they dress casually like Apple and Google? Or more like Wyndham and Lockheed Martin? Leaders set the tone for their company, so it's probably a safe bet to dress like they do. The key thing to look for is a tie. If they're wearing a tie then you should wear something similar. Remember: Dress for where you want to go. Frustration results when reality isn't in line with expectations. Delight is just the opposite, it happens when reality exceeds expectations. Last Thursday, my overloaded closet collapsed from the weight of my hanging clothes. I dreaded the thought of finding a reliable and capable handyman. For months, I'd been quietly watching a team of former Qualcomm alumni working in the corner of a cafe. Their startup was a location based handyman service called House Call. After coming out of stealth mode, I heard their presentation at One Million Cups. I liked their handyman screening process and I loved their promotional legwork. House Call came up with an innovative way to canvas a neighborhood and post door hangers. They first looked up the USPS's delivery routes since that's public information. Next, House Call hired college students to hang their collateral – but how do you supervise their work? Simple, have each student fire up Map My Run and wear it while hanging the door hangers. The students upload their GPS data to House Call for verification and payment. Original nails vs. new 3" screws. I tucked their service away in the back of my mind for the next time I needed home maintenance. So, when my clothes came softly crashing to the ground I gave them a call. I recommend not booking through their website. Instead, use their iPhone app since it has much more functionality. By using GPS, House Call can detect when handymen are in and out of your area. Their app also informs customers when the handyman is on his/her way along with their photo. Although I could book a specific handyman based on ratings I chose to let House Call pick one for me since rapid response was my priority. Within an hour House Call called me to get the details of the job. Less than 30 minutes later, José called me to book my appointment for Friday. The next day, José showed up on time, looked over the work, and turned to. He definitely wanted to do the best job possible. First he showed me the difference between the small nails the builder originally used and his three inch screws. He then asked me if I wanted the sunken screw heads filled in and painted. Thanks, that was much appreciated, but no thanks since I didn't have matching paint. Both the quality of José's work and his attitude exceeded my expectations. Unlike Angie's List, which only provides reviews, House Call vets their contractors. This company is a recipe for success with funding in their pocket and the team from Gimbal at the helm of House Call.